UCLA has another chance at a first-round draft pick and the Bruins are hoping that it will end better this year than last. Defensive end Takkarist McKinley will be in the green room Thursday for the first round of the NFL Draft in Philadelphia, which starts at 5 p.m. PT and is televised on ESPN and NFL Network. 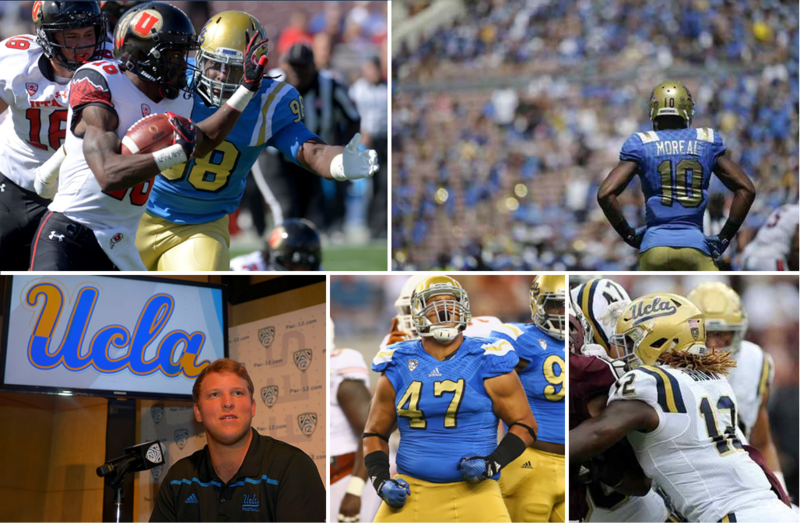 McKinley will be joined by UCLA head coach Jim Mora and defensive line coach Angus McClure as he awaits his NFL fate. Mora said seeing the culmination of McKinley’s dream is “going to be awesome,” but he also recognized the unpredictability of the NFL Draft. Only a year ago, the coach was with former UCLA linebacker Myles Jack when Jack slipped all the way to the second round after being projected as a sure-fire first-rounder. McKinley is not the only hopeful Bruin this weekend. Cornerback Fabian Moreau is expected to be a high second-day pick, likely going in the second round. Defensive lineman Eddie Vanderdoes, offensive lineman Conor McDermott and linebacker Jayon Brown are likely third-day guys. The second day of the draft (the second and third rounds) starts at 4 p.m. PT on Friday and the event wraps up Saturday with the fourth through seventh rounds, starting at 9 a.m. PT. Sports Illustrated writes about the 32nd overall pick (to the Saints): “Take your pick of the remaining cornerbacks—Quincy Wilson, Marlon Humphrey, Fabian Moreau, etc.” The magazine assigns Wilson as the last pick of the first round. This entry was posted in Football and tagged Conor McDermott, Eddie Vanderdoes, Fabian Moreau, Jayon Brown, NFL Draft, Takkarist McKinley by Thuc Nhi Nguyen. Bookmark the permalink. Can Clay Helton and his staff recruit or what! The #5 DT in the country ,and #1 in the West…Fight On! no entrance requirements, no going to class, no drug policy, cheat, lie & booze it up. Look up Ismael Adams. He loves the uber drivers. Or Cade Mcnown. He can get a anyone a handicap card. For a small fee….Fight On…If you can! I can cite u 1000s of MAJORS for sc !! Try and give me 100. I bet you don’t even try. If your talking about OJ? Was he found guilty. Take your best shot! Yes, he was. He’s in jail right now. Who was the mass murderer?